I photographed this snow-covered scene yesterday on a back road in Amish country and it includes numerous buggies and a few walkers as they head to church at one of the farms up the road. There is actually four buggies rounding the bend but they are hard to see in the distance. I really liked the youngster bundled in the green blanket and his sister wearing the bright yellow scarf. It was 16 degrees when I snapped this image,which was made possible by using my camranger from inside my warm truck to fire the tripod mounted camera on my vehicle roof. I had no intention of going out at sunrise because freezing rain was forecast,but as I looked out my bedroom at 5am,I could see stars,so I headed out.Clouds quickly moved in to ruin sunrise and this was shot at iso 1000,which I hate to do,but it was necessary to get a 500th second shutter speed. Was really pleased I Made the effort. 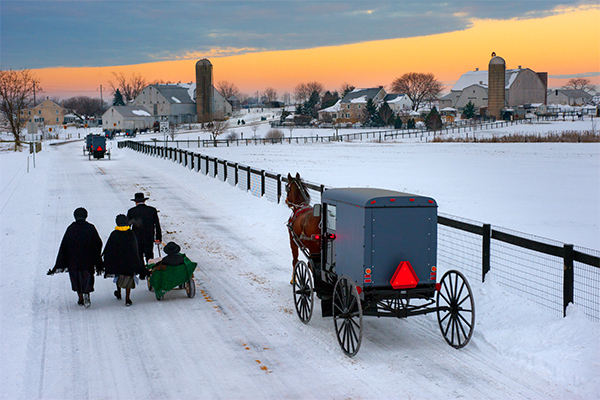 This entry was posted in Amish, Landscape, Photography, Uncategorized, Winter and tagged Amish, Buggy, Church, Farm, horses, lancaster county, Landscape, Photography, snowscene, Sunrise. Bookmark the permalink. That yellow scarf is pretty racy 🙂 Love the long leading line and buggies. Those are some gorgeous Amish barns in the background. Yeah thats about as wild as they get,and i like this location because the road goes between the two farms. Very nice picture Donald. You have captured a beautiful winter sky. You have a good eye for talent. Excellent photograph, Donald; outstanding on so many levels! Thank you so much.its always great to hear from you. I like the walkers, the yellow wrap around the neck, the buggies in the front, the road going between the two farms but the sky is so cool you can almost feel the cold in the air and know that the temps will be bring the cold rain later. You are truly a very talented man.